The rapid and efficient method for sand casting moulds – Ying Feng Precision Machinery Co., Ltd.
What began in the automotive industry is now continuing in many other industrial sectors – the triumphant success of 3D print technology. More and more users value the time and cost advantages offered by this process for the tool-less production of sand moulds for metal casting. And they benefit from the newest developments of this fairly new technology. Cast parts in small batch sizes are very popular. While it used to be mainly automotive manufacturers and suppliers that required very small quantities of metal cast assemblies and components for testing and prototype manufacture and discovered 3D printing as a superior technology for producing the required sand cores and moulds, this method has since established itself in numerous other industrial segments. Today, 3D printing is used in conventional applications and all other situations that require the rapid and efficient production of sand moulds – whether for architecture, restorations, aviation and aerospace or the production of designer furniture. The technology’s breakthrough has not gone unnoticed at the service centre of voxeljet technology GmbH. This is where state-of-the-art 3D printing systems create high-quality sand moulds and cores for metal casting exactly in accordance with customer specifications. “Never before have we printed such a broad spectrum of moulds and assisted so many customers from different industries,” says Dr. Ingo Ederer, CEO of voxeljet technology GmbH. This positive development can be attributed to two factors: Knowledge of the key process-inherent benefits of 3D print technology, which is quickly expanding across industry sectors, and also the quantum leaps in the performance of 3D printing systems, which increase the number of application options. In contrast to the conventional manufacture of moulds, in which the production of model plates or core boxes alone can take several weeks, 3D printing makes it possible to “print” smaller sand moulds in as little as a few hours. The moulds are created without cumbersome and expensive mould set-ups, and are produced in a fully automated process purely based on CAD data using the layer building method, which consists of the repeated application of 300 micrometre thick quartz sand layers that are selectively glued together with a binder using the print head of the system. After the printing process is complete, the mould only has to be unpacked and cleaned of excess sand – that’s all. 3D print technology not only significantly reduces the production time for prototypes and small series, but also places far fewer restrictions on the designer’s freedom of scope than conventional production methods. Designs can be made true to their structure without having to watch for draft angles or undercuts. Even moulds that have been modified during the testing phase can be printed immediately in accordance with the new CAD data, without requiring time-consuming tool modifications. In addition to time aspects, there are also cost saving considerations that favour the use of layer building technologies. When examined with respect to total costs, up to a certain batch size 3D printing is significantly cheaper than conventional methods due to the lack of tool costs. “The smaller the batch size, the greater the cost advantage offered by our voxeljet technology. 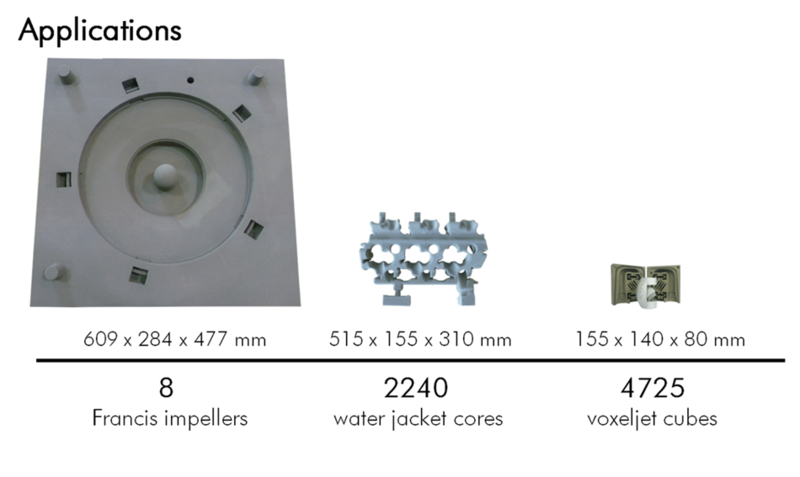 And depending on the complexity and size of the moulds, 3D printing can still be the preferred choice for batch sizes of several hundred parts,” says Dr. Ingo Ederer. one of Europe’s largest service centres for the on-demand production of moulds, but has also made a name for itself around the world as a manufacturer of innovative 3D printing systems. “The past few years have seen veritable quantum leaps with respect to printing quality as well as printing speed. The high-performance print heads of the new machines achieve excellent resolutions and printing speeds that are five times higher than even just a few years ago. In addition, with our VX4000 we are now able to generate moulds of the size of a sports car – something that would have been unthinkable not long ago,” says Dr. Ederer. In fact, the VX4000 machine can produce sand moulds with a volume of eight cubic metres with the dimensions 4 x 2 x 1 metres, which has allowed voxeljet to open up an unimagined number of opportunities for users. The huge build space provides sufficient room for the rapid production of extremely large individual moulds, but can also be used for the efficient production of small series. 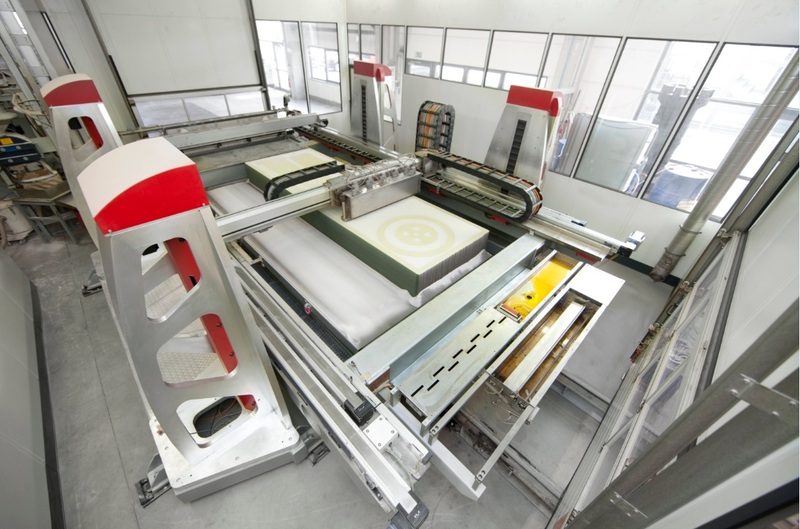 The machine operates at more than three times the build speed of voxeljet’s standard printers, but with the same resolution and precision. This performance is made possible with the use of a particularly wide print head, resulting in time and cost savings for users. The system design consisting of building platforms that are alternately inserted into the process station allows for continuous building in three-shift operations. An example of the opportunities and design scope offered by today’s 3D print technology is the production of designer furniture in limited quantities. This trend-setting method can be used to produce spectacular designs at competitive production costs, as evidenced by the Batoidea chair design. Batoidea, or stingray, is the name for a designer chair created by Belgian star designer Peter Donders ( www.morphs.be ). The design really does conjure up the image of an elegantly gliding stingray, visualising lightness and airiness, and impressing with its elegance. 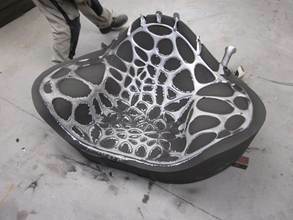 The production of this chair, which breaks with convention and is made of aluminium casting, would have been virtually impossible in terms of financial aspects without the use of 3D print technology. 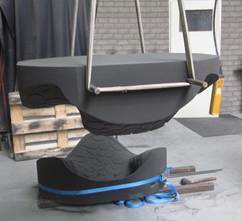 The production of the generously sized chair with its complex stingray design required a total of five sand moulds, which were produced at voxeljet’s service centre in Augsburg. The largest individual mould measured 1.105 x 713 x 382 millimetres – a size easily handled by voxeljet’s high-performance printers. The chair production process placed great demands on 3D printing and the cast, as the design consists of a very thin-walled aluminium cast structure, which undergoes further processing until the application of the finishing varnish. “For us, as the pioneers of the 3D print technology, it is nice to see how this trend-setting method is establishing itself in more and more industries. And it appears that the sky is the limit with respect to potential application areas. Sometimes even we are surprised by the creativity of our customers. From exclusive birthday gifts and reconstructed temple models to complete vehicle models and components for racing, designer furniture and architectural models – we are discovering new application areas for 3D printing every day,” concludes Dr. Ingo Ederer.